Britain's Prince Harry, left Australia's Prime Minister Scott Morrison, right, and Invictus Games representatives climb the Sydney Harbour Bridge in Sydney, Tuesday, Oct. 19, 2018. Prince Harry and his wife Meghan are on day four of their 16-day tour of Australia and the South Pacific. 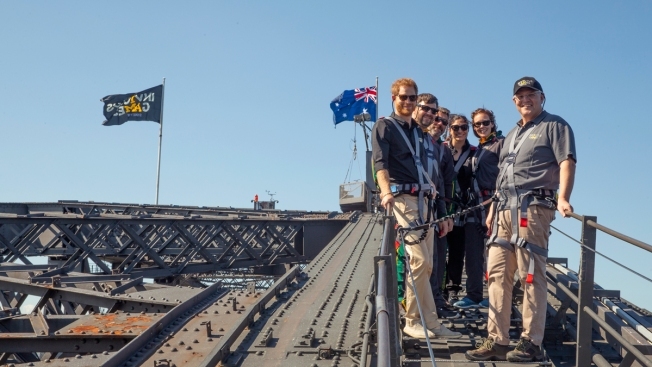 Prince Harry scaled the Sydney Harbor Bridge on Friday to raise a flag marking the arrival of the Invictus Games, his brainchild and the focus of his current royal tour of Australia and the South Pacific. The sporting event, founded by Harry in 2014, starts on Saturday. It gives sick and injured military personnel and veterans the opportunity to compete in sports such as wheelchair basketball and to find inspiration to recover. The fact that the Duchess of Sussex never planned to climb the world's tallest steel arch bridge with her husband had fueled speculation that she is pregnant. The speculation was confirmed on Monday when Harry and the former Meghan Markle announced that their first child is due in the northern spring. 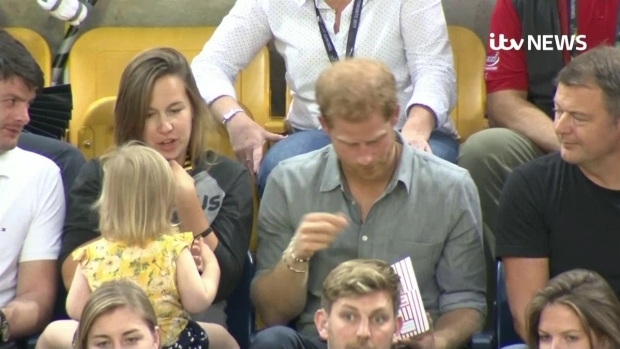 Harry, Prime Minister Scott Morrison, four members of the Australian team and the widow of an Australian veteran climbed more than 1,000 steps up the back of an arch to raise the Invictus Games Sydney 2018 flag. "The Sydney Harbor Bridge is an Australian icon and I can think of no better place to raise the ... flag," Morrison said in a statement. During the descent, Harry hugged fellow climber Gwen Cherne, a games ambassador whose husband Peter Cafe, a veteran of Iraq and Afghanistan, took his own life in February. "We were talking about mental health and really working on changing the way that our global community looks at mental health and deals with it," Cherne said later. The flag will fly 134 meters (440 feet) above Sydney Harbor until the games close on Oct. 27. Harry and his American former actress wife will attend the opening and closing games ceremonies. Around 500 athletes from 18 nations will compete in venues around Sydney. The couple earlier Friday walked barefoot on Bondi Beach to meet a group of surfers focused on mental wellbeing. The group, OneWave, meet weekly in an "anti-bad vibe circle" on the sand. While the group dressed in loud and outrageous fluorescent outfits, Harry and Meghan were more subdued, but their message to the group was clear. "They're super passionate about mental health. They are showing that mental health does not discriminate," OneWave co-founder Grant Trebilco said. Charlotte Connell, a OneWave member, said Harry spoke of his own experiences seeking counselling more than 20 years after his mother, Princess Diana, died in a car crash in a Paris tunnel in 1997 when he was aged 12. "Harry said it took him not six months, but 18 months to find the right person to speak to. 'You're not going to find the right person to speak to straight away,'" Connell said. Both Harry and Meghan used exercise as a way of keeping well, Connell said. "Even in her jetlagged state, she got up in the morning and did yoga at 4.30 a.m.," Connell said. "She said it's so good for healing her mind," Connell added. After Bondi, the couple made an unannounced visit to Macarthur Girls High School in Parramatta in central Sydney. The shrieking students gave the couple a rock star welcome to a school assembly. "When they walked in, I felt like my heart stopped. Their presence just made everyone shocked," 15-year-old student Rhiannon said. The couple finished their day's events with formal meetings with Morrison and opposition leader Bill Shorten. Harry and Meghan will also visit Fiji, Tonga and New Zealand during their 16-day tour.